More than 68% of American households owned a pet in 2017, according to a report from the National Pet Owners Survey. That's roughly 85 million families with a small pet — a figure that is expected to grow. With that growth, there's bound to be more demand for veterinarians. 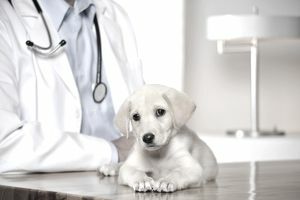 Small animal veterinarians are practitioners who specialize in the health management of dogs, cats, birds, exotics and other companion animals. Here's a look at what's you need to become a vet and the overall industry. The typical routine for a small animal vet includes performing wellness exams, giving routine vaccinations, drawing blood, prescribing medications, evaluating and suturing wounds, performing surgeries (such as spay/neuter procedures), performing post-surgical follow-up exams, and cleaning teeth. Other duties may include performing health exams on young animals, monitoring the reproductive health of breeding animals, assisting with problem births, using ultrasound machines and taking x-rays. It is common for veterinarians to work both day and evening hours, and they are often “on call” for potential emergencies that might arise on weekends and holidays. Some veterinary offices, especially small animal clinics, are open on Saturday for a half or full day, though most are closed on Sunday. A few small animal practitioners offer mobile veterinary clinic services, traveling to visit their patients in a specially modified van equipped with the necessary medical gear. According to statistics from the American Veterinary Medical Association (AVMA), more than 66% of vets worked in private practice and catered exclusively to companion animals in 2017. While some vets choose to work exclusively on small, companion animals, others may operate mixed practices that also provide equine or other large animal veterinary services. Outside of private practice, vets also find work as college professors or educators, pharmaceutical sales representatives, military personnel, government inspectors, and researchers. All small animal veterinarians graduate with a Doctor of Veterinary Medicine (DVM) degree, which is the culmination of a rigorous course of study involving both small and large animal species. According to the Association of American Veterinary Medical Colleges (AAVMC), there are 30 accredited colleges of veterinary medicine in the United States that offer a DVM degree to their graduates. Upon graduation, vets must also successfully complete the North American Veterinary Licensing Exam (NAVLE) to become professionally licensed. Approximately 3,000 veterinarians graduate, pass the NAVLE exam and enter the veterinary field each year. At the end of 2017, the most recent AVMA employment survey available, there were 110,531 practicing U.S. veterinarians. About 9% operated in small animal predominant practices. The American Veterinary Medical Association (AVMA) is one of the most prominent veterinary organizations, representing over 91,000 practitioners. Another large veterinary organization is the World Small Animal Veterinary Association (WSAVA), which is comprised of 105 member associations representing 200,000 small animal vets worldwide. The median wage for veterinarians is approximately $90,420 according to the April 2018 BLS salary survey statistics. Earnings in the survey varied from under $53,980 for the lowest 10% of all veterinarians to more than $159,320 for the top 10% of all veterinarians. According to the AVMA, the average starting salary for a new veterinarian varied based on the type of practice. Small animal exclusive vets started out with the highest average salary of $71,462 in the first year. A large animal exclusive vet started at $68,933, while the starting salary for a mixed-practice vet (who practices both large- and small-animal medicine) was $62,327. Equine vets started at the lowest first-year salary, with just $38,468. Veterinarians who are board certified in a particular specialty area (ophthalmology, oncology, surgery, etc) generally earn significantly higher salaries as a result of their advanced education and experience. As of 2017, AVMA data indicated there were 416 board certified canine and feline diplomates and 707 board certified small animal surgeons (nearly double the number of board-certified small animal surgeons since 2010). Some vets may hold both certifications. The total number of active board-certified diplomates as of the end of 2017 was 13,035. According to data from the Bureau of Labor Statistics, the veterinary profession will expand at a faster rate than the average for all professions surveyed, about 20% over the decade from 2016 to 2026. The limited number of graduates from vet programs will translate to excellent job prospects in the field. According to a 2017 report from the AVMA, 4,477 new veterinarians entered the profession at the end of 2016 after successfully passing the licensing exam. The AVMA’s most recent employment survey (December 2017) found that there were 71,393​ vets in private practice. Of that number, there were 47,545 vets in companion animal exclusive practices and an additional 6,368 in companion animal predominant practices. With the steadily increasing numbers of animals kept as pets, as well as the steady increase in medical spending on those pets, the veterinary profession should continue to be a rewarding business over the next decade and beyond.